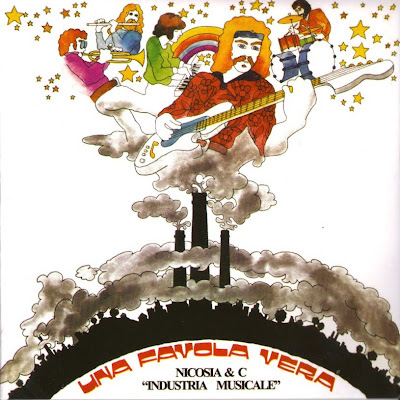 Named after their leader, guitarist Nuccio Nicosia, Industria Musicale were formed in 1972 with an unusual 12-piece line-up including a full horn section. Based in Piemonte (Piedmont, northern Italy) though some of the musicians came from other areas, their sound was a mixture of melodic pop, rock, prog and jazz, strongly characterized by the heavy use of brass instruments. Their only album Una favola vera, released by Fonit in 1973, is a unique example of orchestral prog rock in the Italian scene, and though the horn arrangements are a bit intrusive at times, is an interesting listen. It includes eight tracks, four of which are instrumental. Some similarities with Showmen (or their later incarnation Napoli Centrale) can be heard in the melodic vocal parts and the use of horns, but the sound is very rich and definitely jazz-styled in the solo interludes, much in the same direction as some foreign groups like Blood Sweat and Tears or even Chicago in their lighter side. The name Nicosia & C. Industria Musicale was seen again on two commercial-styled singles issued in 1975 and 1976, then it disappeared forever. Many of the group members remained in the music scene after the album, some of them were mostly in the jazz field. Trombonist Johnny Capriuolo played with Arti e Mestieri in their 1985 Children's Blues album (along with Pierluigi Mucciolo), he was a trained player and a music teacher and died in 2000. Horn player Pierluigi "Gigi" Mucciolo appeared as session musician on some Ivan Graziani and Lucio Battisti albums, like Umanamente uomo: il sogno, Il mio canto libero and Anima latina, assisted in the last one by Colucci and Bogliano. The latter has long played in the Gianni Basso Big Band. Trumpet player Mariannini has collaborated with various jazz and ethnic groups in the Florence area. Drummer Luciano Alì has played as session musician and still plays now with the folk group Tendachent, born from the ashes of La Ciapa Rusa, one of the most important northern Italy folk revival groups. Singer Nereo Villa, now a psycho-astrologist, also had a long experience as composer and still has interest in music.